WASHINGTON — Few things can improve the mood of a cold and rainy weekday morning, short of multiple cups of coffee and an extended stay in pajamas. But over at Equinox Restaurant, just steps from the White House, Todd Gray cooked up a cure. “What does that look like to you?” Gray asked, while putting finishing touches on a plate in the back of his kitchen. “A very familiar breakfast food,” was my response. And if I had to guess, the sandwich composed of melted cheese, an inch-thick yellow disc, and a toasted and buttered English muffin would look familiar to most Americans. “We’re going to think we’re somewhere else when we taste it,” Gray said. Sure enough, two golden arches came to mind the second the sandwich hit my mouth. But there were a few differences between Gray’s egg sandwich and the original that inspired the well-known D.C. chef. Most notably, his wasn’t made of egg. It was made from the mung bean. In the last few years, plant-based products have burst onto the scene in an industry previously starved for alternatives to meat and dairy. Look closely at grill grates across the country this summer, and you may notice something new kissing the flames. It’s a patty that looks like ground beef, sizzles like ground beef, even bleeds like ground beef — but it isn’t made from beef. 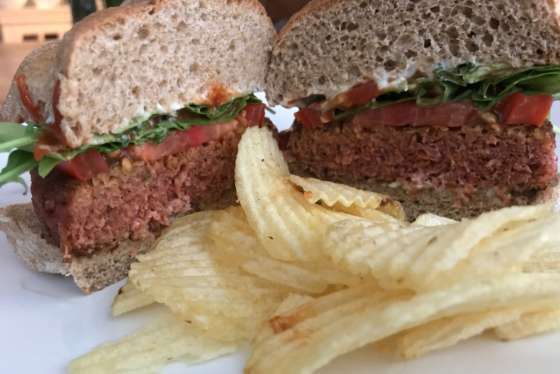 Beyond Meat — which makes a burger from pea protein that looks like meat, cooks like meat and “bleeds” like meat — reported more than $38 billion in revenue in 2017, the Chicago Tribune reports. It’s available in about 8,000 restaurants, hotels and campuses around the country, and starting July 9, will be on the menu at 1,000 A&W locations in Canada, the country’s second-largest burger chain. In April, White Castle started selling faux-meat sliders from Impossible Foods, a company that makes the Impossible Burger and has the backing of Bill Gates. And this summer, consumers can expect to see a plant-based egg product that scrambles up just like the real deal. Its name is Just Egg. 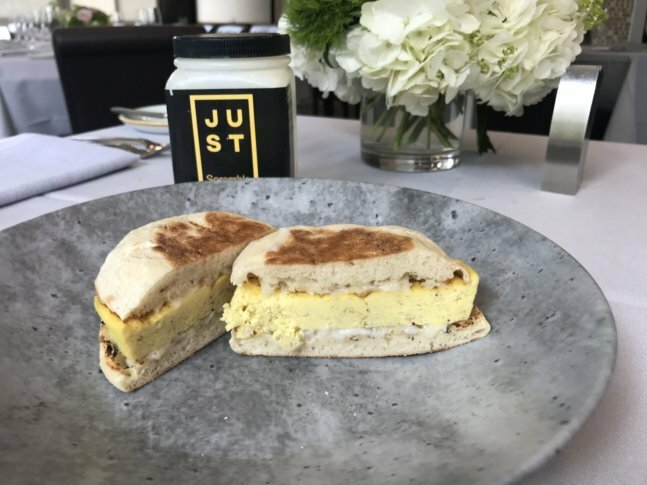 “I think part of the reason that a lot of these newer, sustainable, plant-based focused products are doing well is because people want that,” said Ben Roche, director of product development at JUST, the California-based food technology company behind Just Egg and Just Mayo. “People are more in-tune with where their food is coming from; they care about it a lot more. I think health is becoming more of a global concern — not just food safety, but also personal health. And so I think for a lot of these reasons that are all kind of colliding at the same time, there’s this really explosive interest in not just foods that are better for the planet or for your body, but also foods that are as delicious as the thing that some people might feel like they’re giving up,” he said. For the last four years, a team of chefs, food scientists and biochemists at JUST have been working to make a protein extracted from the mung bean look, smell, taste and feel like egg. When Just Egg is poured from the bottle and into a hot pan, it forms curds as it cooks. “Everything has to really hit every point or else it just seems like a science project. And no one wants to eat a science project,” Roche said. Over at Equinox, Gray is cooking with Just Egg in a number of different ways. The fine-dining restaurant, which features both meat and vegetable dishes, hosts a vegan brunch every Sunday, and Gray said it made sense to add Just Egg to his tofu scramble station. Beyond that, he is using the pourable plant-based product as an egg wash on spring rolls, as a sticky coating for breaded vegetables and as the base for a béarnaise sauce. When it comes to dessert, Gray whips Just Egg with sugar and Marsala wine in a bowl over boiling water to make a zabaione, which he spoons over fresh berries. “It’s helped us be able to do more [in dishes] where we felt sometimes we had to revisit with other egg substitute or egg replacement types of product,” Gray said. To make a basic scramble or an omelet, Gray uses a little more seasoning than he might when preparing real eggs. He recommends a “gentle” hand with a spice blend (his has turmeric and sumac), plus salt and pepper. “So you just drive enough complexity into it so that it doesn’t overpower it, but it gives it some richness and on the palate it has a little bit more vibrancy than say, an egg substitute,” he said. Adding butter (or a butter substitute), olive oil and cheese doesn’t hurt, either. “The egg is the simplest product but is the most difficult one to master. … It’s a foundation of cooking, so it’s something we take seriously, egg cookery,” Gray added. A statement from JUST said Just Egg will be available to grocery and food service distributors “in the coming months,” but doesn’t list an exact date for its release. Several stores in the D.C. area, including Whole Foods, Giant, Harris Teeter and Safeway, carry other JUST products. For now, those interested can test it out at Equinox. Roche said as food technology continues to advance, consumers can expect to see other, more innovative, animal-free foods. “It’s this whole boom of other companies doing equally as impressive things with other types of food. So I think it’s only a growing category, a new industry popping up that’s only going to get bigger in the next 10 to 15 years,” he said.